Shark Week is upon us! What better way to celebrate that finding shark crochet patterns! Time to get your hook out and made these awesome patterns! Hammerhead Shark Crochet Pattern – This is just adorable. Perfect stuff shark for a little one. Shark Bag – Cute little bag to use for a purse or a fun on for a child! Amigurumi Shark Pattern – This Great White is safe to play with! He won’t bite, I promise. Shark Pencil Pouch – Cute idea for kids to keep their pencils in for school. Shark Crochet Pin Pattern – This little pin is easy to whip up in no time! Would be great to add to a child’s backpack! Shark Popsicle Holder – Great way to keep the kids hands from freezing when they eat a popsicle! Bernard the Ball Shark Amigurumi Softie Crochet Pattern – What a cute round Great White! He looks so cuddly even with his sharp looking teeth! Super Cute Shark Afghan Pattern – The name says it. It is cute! This is a side view of a shark as a blanket. 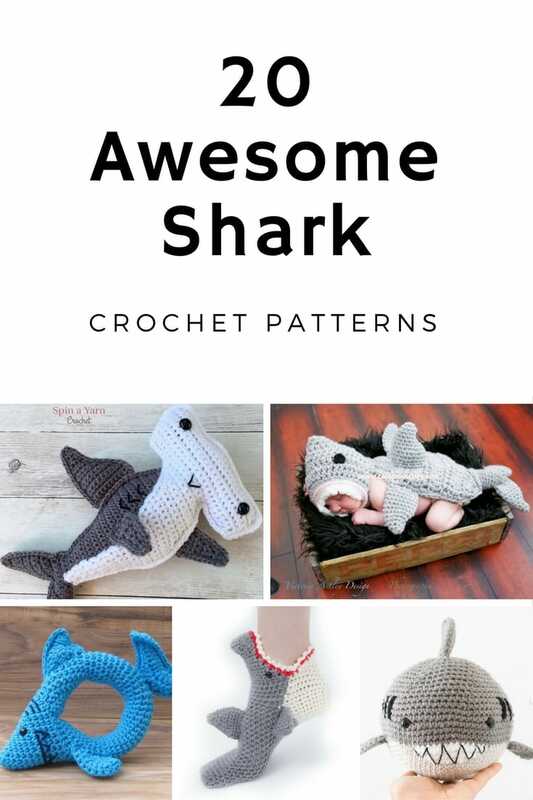 Crochet Shark Sleep Sack Pattern – This sleep sack is for a child sized sleep sack, however the alterations are explained for teens and adults! Shark Puppet Scrubby – Cute idea to make for the kids’ bath time! Women’s Shark Socks Crochet Pattern – Nothing like slipping on these shark socks to start watching Shark Week or JAWS! Dog Shark Costume – Don’t forget your dog! Get them into Shark Week or Halloween with this cute outfit! Gummy Shark Scarf – Love those gummy sharks? This scarf is just too cute to pass up! Shark Crochet Hat Pattern – This is the perfect hat for a shark lover! Shark Rattle Pattern – Love how adorable this rattle is!! Cute idea for a baby shower gift! Jawesome Shark Cuddle Critter Cape Set – This is beyond cute! If you are a photographer, you need this in your props. Shark Granny Square Pattern – Make a cute Shark themed blanket with this Granny Square! Shark Crochet Cozy Pattern – This reminds me of the JAWS Movie Poster! Shark Corner-2-Corner Blanket – I just love the C-2-C look and I really need to try making a blanket. Maybe I will start with this? Shark-A-Jack – Cute little doll with a shark costume. Just darn cute! I love your blogs!! Thank you for sharing!